A lot of design trends have come and gone, but few are as iconic as the pink bathrooms of the 1950s. 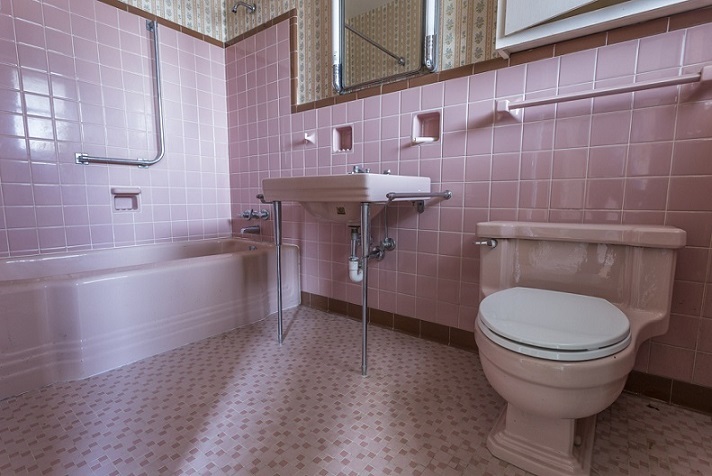 Pam Kueber, founder of the “Save the Pink Bathrooms” campaign, estimates pink was the most popular color for bathroom vanities and tile during this time period, and was included in some five million American homes built between 1946 and 1966. It’s understandable why pink would find its way into a 1950s home, but what do you do with a pink bathroom today? This depends on a few things, like the bathroom’s current state. A lot of pink bathrooms were made with high-quality materials and are still in great shape. Just a few tweaks can bring a pink bath out of the past and make it look more modern. However, if you’re looking at plumbing or safety issues, or your pink bathroom is just not keeping up with your needs anymore, your remodeler can help you start from scratch. Kueber has a request though: be nice about it. Even if no trace of a pink bathroom will remain after your bathroom remodelers are done, she encourages homeowners to recognize the love that went into designing the bathroom and how well it has served the home for decades. Can’t decide what to do with your pink bathroom? Let DreamMaker Bath & Kitchen of Livonia help you out. To get started, simply give us a call at (734) 390-9191. Let’s start a conversation!